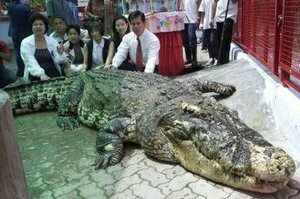 SYDNEY: A crocodile which measures 18 feet in length has been officially recognised by the Guinness Book of Records as the largest crocodile in captivity. The fearsome croc, known as Cassius is a resident at Marineland Melanesia on Green Island off the coast of Cairns (northern Queensland, Australia). The crocodile, believed to be over 100 years old has been in captivity since it was brought to the marine park back in 1987, having been captured in the wild near to Darwin a few years earlier. It was captured as it had attacked a number of boats in the Darwin area and it was thought to be too big and dangerous to be left at large.